How do I set different wallpapers for each monitor in Windows? I wanted a different wallpaper (or "screensaver," for the non-technical relatives, because I know you call desktop wallpaper that) for each of my multiple monitors in Windows. 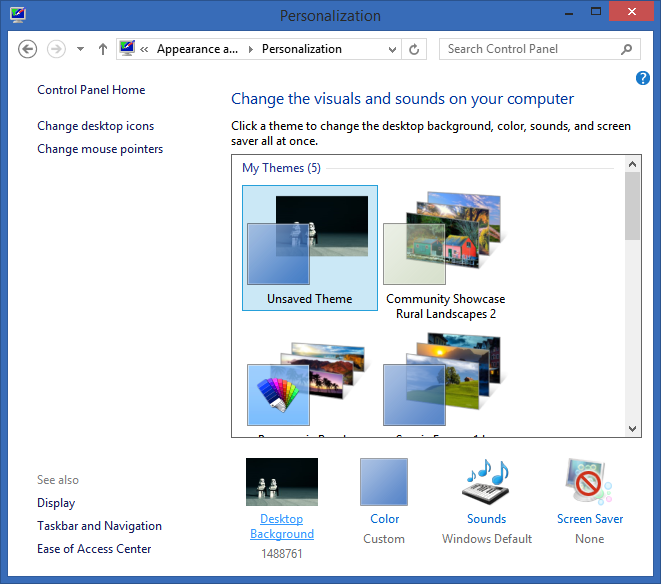 To start changing your wallpaper, first right-click on the desktop on click Personalize. 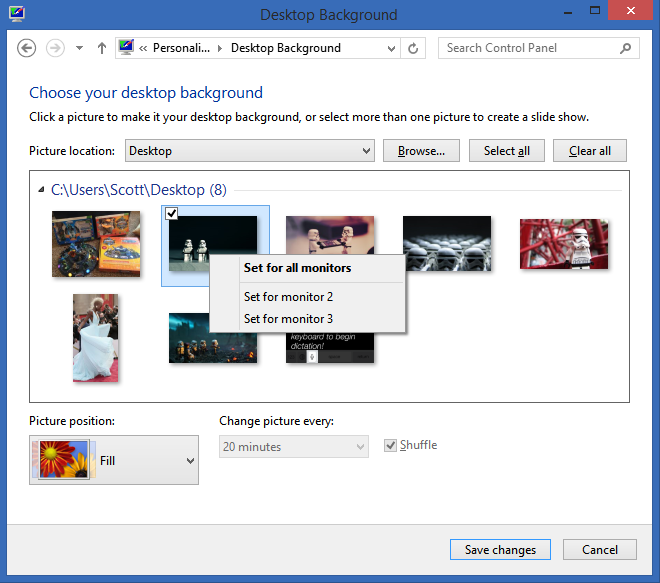 Click the words "Desktop Background" at the bottom of the Personalization dialog. Now, from here, if you LEFT-click a wallpaper you're selecting that wallpaper for ALL your monitors. BUT, if you RIGHT-click on an image, you can set wallpapers individually. Is this working for Windows 7 as well? Thanks for the tip Scott - also see "John's Background Switcher". I still use this as it make multi monitor easy & does a nice job of fit to height/width while filling extra space with a colour derived from the photo. Well, stone the crows! Never knew that. That is cool. For Win 7, I stitched 2 pngs together. We work with what we have! Wanted this. Gave up trying to figure it out. Windows 8 only, not supported on Windows 7. I'm curious if this works for those of us who are only occasionally connected to a second screen. If I set this up and then disconnect from my monitor for a time, does it remember when I reconnect the monitor or do I have to configure it again? On Windows 8, selecting multiple images to shuffle thru seems to automatically display different images on each monitor. (That's what I prefer.) But selecting multiple images doesn't seem to allow this right click option to disable it. One nice effect with shuffling background images, sets the active window's border color based on the current background image's predominant color. As the backgrounds images shuffle, the border color changes for a nice ambient lighting effect. Only windows with borders (e.g. Browsers, notepad, etc, not Outlook, OneNote etc) display this effect. As is only too often the case, this is yet another thing that I've read on the internet that just doesn't work on my machine - seeing the same as @Scott. Not quite as annoying as when I'm looking up the solution to a software issue, but it has taken the edge of an otherwise satisfying Thursday at work. What I'd love to be able to do is have the text size independent for each monitor. DisplayFusion has a free version that lets you set different wallpapers for each screen. The paid version changes the wallpaper for each screen every x minutes. I just recently changed my second monitor to a vertical display, and the multi-monitor solution I had for double-horizontal displays wasn't cutting it. Thanks for the tip! Works perfectly for my situation. I know you are good, how ever I tried your ASP.NET MVC Cheesy Northwind project and found out it is broken in MVC 5. I only have VS2013 and would like to learn MVC. Anyway you could get it to work with MVC 4 or 5? Looks like the RenderView is no longer supported in the current version of MVC. The Binding function also seemed to disappeared. How can I get around this. I am a cabinet maker and need all the help I can get. Keep up the good work as I do read your blogs. I want to add search capability to my web site. This is excellent. (works great on Windows 8) I did not know that. I use Bing Desktop which changes my wallpaper daily to give me a please surprise every 24 hours. also syncs on all my desktops and laptops and windows phone, (windows phone has its own feature as you would already know that). This would've been really useful when I was showing support for my World Cup sweepstake teams, had a constant struggle with this for the entire tournament! What I've found is that these setting are synchronized between my Win8 computers. Is there any way of setting some pictures to not be shown on some computers? I gave up on wallpapers a while ago (basic black is much easier on the eyes). But back when I did use wallpapers on multiple monitor setups the workaround I used was photoshop -- I would just go build a 3200x1200 image or what have you and set things to not scale. Also worked great on uneven monitor setups. It's not free, but it is worth the small investment.